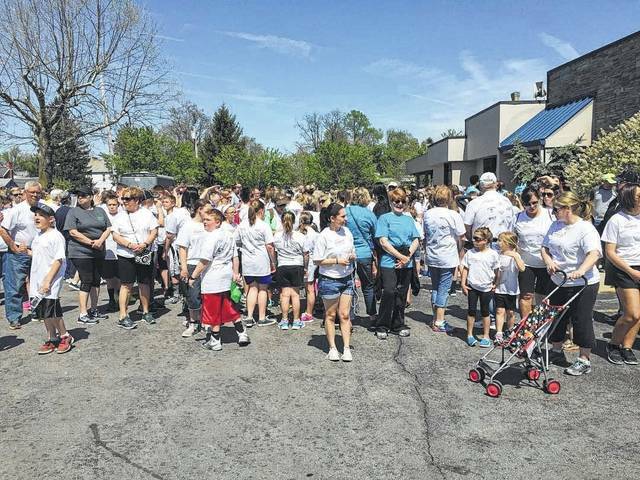 The annual Hike for Hospice to benefit Hospice of Fayette County is slated for Sunday, April 29. The event, which will be held rain or shine, begins and ends at Merchants National Bank starting at 3 p.m. Pre-registration will be $10 and is available starting April 1 at www.hospice-fayco.org or by visiting Hospice of Fayette County at 222 N. Oakland Ave. in Washington C.H. The registration fee includes an event t-shirt as well as pizza and drinks following the walk. All hikers, competitive or noncompetitive, are encouraged to obtain donations for their participation in this annual event. Donations can be used to pay for registration fees and Hike for Hospice participants can compete in a variety of award categories: most hikers in a group, most hikers in a youth group, most donations as an individual, most donations as a team and most donations for a corporate team. Teams and individuals must be registered, and all donations turned in, by Wednesday, April 25 to be counted toward final standing for awards. Additional team information and forms are available from Hospice of Fayette County. Those who wish to do so can make a donation and receive a t-shirt without participating in the walk. Hike for Hospice will include the annual Memory Walk display as part of the route, which will feature signs purchased in memory or honor of a loved one. A $6 donation per name is requested for the memory signs and orders can be placed at the Hospice of Fayette County. Participation in Hike for Hospice is not required for purchase of a memory sign. Memory signs can be removed and kept as a keepsake following the event. Sponsors of the Hike for Hospice include Merchants National Bank, Doug Marine Motors, Fayette Home Health Care Supply, BK Exteriors Roofing and Siding, Court House Manor and St. Catherine’s Manor, Quali-Tee Designs Sportswear, Vermeer Heartland, Pettit’s, Fayette County Memorial Hospital and Walmart. For more information please call (740) 335-0149 or visit www.hospice-fayco.org. The information in this article was provided by Ohio’s Hospice of Fayette County.